[S1] Ruth Bennett, Naudain Family of Delaware (Geneva, Neb. : n.pub., 1941), p. 90. This material is a typescript of "notes" in Ms. Bennett's possession and apparently was originally written and compiled by James W. Lattomus. Copies are with the D.A.R. Library, Washington, D.C., and Roger Bartlett, Austin, Tex., and can be viewed at http://www.rabgenealogy.com/ui53.htm. The notes contain some inconsistencies, and page 45 was missing from the D.A.R. Library copy when it was copied. [S427] Portrait and Biographical Record of the Eastern Shore of Maryland (New York, N.Y..: Chapman Pub. Co., 1898), p. 131 (giving her name as Annie W. Hyland and naming William A. Hyland as her father). [S1] Ruth Bennett, Naudain Family of Delaware (Geneva, Neb. : n.pub., 1941), p. 90 (naming William A. Hyland as her father). This material is a typescript of "notes" in Ms. Bennett's possession and apparently was originally written and compiled by James W. Lattomus. Copies are with the D.A.R. Library, Washington, D.C., and Roger Bartlett, Austin, Tex., and can be viewed at http://www.rabgenealogy.com/ui53.htm. The notes contain some inconsistencies, and page 45 was missing from the D.A.R. Library copy when it was copied. [S427] Portrait and Biographical Record of the Eastern Shore of Maryland, above, p. 131 (giving her name as Annie W. Hyland and stating in 1898 that she was the wife of Herbert Price without giving a marriage date). [S427] Portrait and Biographical Record of the Eastern Shore of Maryland (New York, N.Y..: Chapman Pub. Co., 1898), p. 131 (giving her name as Annie W. Hyland and stating in 1898 that she was the wife of Herbert Price without giving a marriage date). [S427] Portrait and Biographical Record of the Eastern Shore of Maryland (New York, N.Y..: Chapman Pub. Co., 1898), p. 131 (naming William A. Hyland as her father). [S961] Find A Grave, online at http://www.findagrave.com, memorial for Elizabeth C. Hyland Wilson, memorial no. 37316085, viewed on 23 Feb 2012 (naming William A. Hyland as her father). [S961] Find A Grave, online, above, memorial for Elizabeth C. Hyland Wilson, memorial no. 37316085, viewed on 23 Feb 2012. [S427] Portrait and Biographical Record of the Eastern Shore of Maryland, above, p. 131 (stating in 1898 that she was the wife of J. R. Wilson without giving a marriage date). [S961] Find A Grave, online, above, memorial for Elizabeth C. Hyland Wilson, memorial no. 37316085, viewed on 23 Feb 2012 (naming J. R. Wilson as her husband) (not giving the date). [S427] Portrait and Biographical Record of the Eastern Shore of Maryland (New York, N.Y..: Chapman Pub. Co., 1898), p. 131 (stating in 1898 that she was the wife of J. R. Wilson without giving a marriage date). [S961] Find A Grave, online at http://www.findagrave.com, memorial for Elizabeth C. Hyland Wilson, memorial no. 37316085, viewed on 23 Feb 2012 (naming J. R. Wilson as her husband) (not giving the date). [S961] Find A Grave, online, above, memorial for Elizabeth C. Hyland Wilson, memorial no. 37316085, viewed on 23 Feb 2012 (naming J. R. Wilson as her husband). Other Names*: Emma Hyland, Emma Estella Van Zandt, Emma Hyland Van Zandt, Emma Van Zandt, Emma Estella Vansant, Emma Hyland Vansant, Emma Vansant. [S1] Ruth Bennett, Naudain Family of Delaware (Geneva, Neb. : n.pub., 1941), pp. 90-91 (naming William A. Hyland as her father). This material is a typescript of "notes" in Ms. Bennett's possession and apparently was originally written and compiled by James W. Lattomus. Copies are with the D.A.R. Library, Washington, D.C., and Roger Bartlett, Austin, Tex., and can be viewed at http://www.rabgenealogy.com/ui53.htm. The notes contain some inconsistencies, and page 45 was missing from the D.A.R. Library copy when it was copied. [S427] Portrait and Biographical Record of the Eastern Shore of Maryland, above, p. 131 (stating in 1898 that she was the wife of J. R. Van Zandt without giving a marriage date). Other Names*: J. R. Vansant, L. Rochester Van Zandt, J. R. Van Zandt. [S427] Portrait and Biographical Record of the Eastern Shore of Maryland (New York, N.Y..: Chapman Pub. Co., 1898), p. 131 (stating in 1898 that she was the wife of J. R. Van Zandt without giving a marriage date). [S1] Ruth Bennett, Naudain Family of Delaware (Geneva, Neb. : n.pub., 1941), p. 91. This material is a typescript of "notes" in Ms. Bennett's possession and apparently was originally written and compiled by James W. Lattomus. Copies are with the D.A.R. Library, Washington, D.C., and Roger Bartlett, Austin, Tex., and can be viewed at http://www.rabgenealogy.com/ui53.htm. The notes contain some inconsistencies, and page 45 was missing from the D.A.R. Library copy when it was copied. [S427] Portrait and Biographical Record of the Eastern Shore of Maryland, above, p. 131 (giving his name as J. R. Van Zandt). [S427] Portrait and Biographical Record of the Eastern Shore of Maryland (New York, N.Y..: Chapman Pub. Co., 1898), p. 131 (naming William A. Hyland as his father). [S1] Ruth Bennett, Naudain Family of Delaware (Geneva, Neb. : n.pub., 1941), pp. 90-91 (naming William A. Hyland as his father). This material is a typescript of "notes" in Ms. Bennett's possession and apparently was originally written and compiled by James W. Lattomus. Copies are with the D.A.R. Library, Washington, D.C., and Roger Bartlett, Austin, Tex., and can be viewed at http://www.rabgenealogy.com/ui53.htm. The notes contain some inconsistencies, and page 45 was missing from the D.A.R. Library copy when it was copied. [S1340] The Morning News, Wilmington, Del., online at http://www.newspapers.com, 10 Oct 1942, p. 12, col. 2 (marriage announcement for Miss Mary Naudain Hyland and Lt. Edward A. W. Peters, Jr.) (naming Mr. and Mrs. William A. Hyland as her parents). [S1] Ruth Bennett, Naudain Family of Delaware, above, p. 91 (giving 19 Aug 1873 as his death date, which probably is a misstatement of 19 Aug 1878 based on the statement in this same source that he was born on 3 May 1875). Other Names*: Richard Naudain, Louis M. Naudain, Louis Naudain. • His Find A Grave memorial, which includes his obituary and pictures of his tombstone, is here. [S1] Ruth Bennett, Naudain Family of Delaware (Geneva, Neb. : n.pub., 1941), p. 91 (naming Richard Lockwood Naudain as his father). This material is a typescript of "notes" in Ms. Bennett's possession and apparently was originally written and compiled by James W. Lattomus. Copies are with the D.A.R. Library, Washington, D.C., and Roger Bartlett, Austin, Tex., and can be viewed at http://www.rabgenealogy.com/ui53.htm. The notes contain some inconsistencies, and page 45 was missing from the D.A.R. Library copy when it was copied. [S1340] The Morning News, Wilmington, Del., above, 8 Nov 1948, p. 4, col. 4 (obituary of Richard L. Naudain) (naming Lillie Cann as his mother). [S1] Ruth Bennett, Naudain Family of Delaware, above, p. 91 (giving the date but not the place). [S1340] The Morning News, Wilmington, Del., above, 8 Nov 1948, p. 4, col. 4 (obituary of Richard L. Naudain). 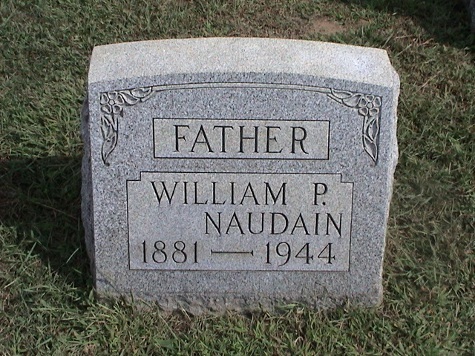 [S961] Find A Grave, online at http://www.findagrave.com, memorial for Richard L. Naudain, memorial no. 66374189, viewed on 1 Jul 2016 (not giving the date). [S961] Find A Grave, online, above, memorial for Grace F. Naudain, memorial no. 66374178, viewed on 1 Jul 2016 (not giving the date). [S1343] Journal-Every Evening, Wilmington, Del., online at http://www.newspapers.com, 14 Oct 1959, p. 24, col. 2 (obituary of Mrs. Richard L. Naudain) (not giving the date). [S961] Find A Grave, online, above, memorial for Richard L. Naudain, memorial no. 66374189, viewed on 1 Jul 2016 (giving the year but no other information). [S1337] The Evening Journal, Wilmington, Del., online at http://www.newspapers.com, 17 Jun 1905, p. 5, col. 2. Advertisement in The News-Journal, Wilmington, Del., 2 Sep 1905. 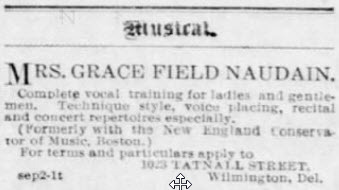 Other Names*: Grace Belle Field Naudain, Grace Field Naudain, Grace Belle Naudain, Grace Naudain. • Her Find A Grave memorial, which includes photographs of her tombstone, is here. [S1340] The Morning News, Wilmington, Del., online at http://www.newspapers.com, 8 Nov 1948, p. 4, col. 4 (obituary of Richard L. Naudain) (naming Capt. Ellsworth Field as her father). [S961] Find A Grave, online at http://www.findagrave.com, memorial for Grace F. Naudain, memorial no. 66374178, viewed on 1 Jul 2016. [S1343] Journal-Every Evening, Wilmington, Del., online at http://www.newspapers.com, 14 Oct 1959, p. 24, col. 2 (obituary of Mrs. Richard L. Naudain) (not giving the date but stating that she was seventy-seven years old when she died on 13 Oct 1959). [S961] Find A Grave, online, above, memorial for Richard L. Naudain, memorial no. 66374189, viewed on 1 Jul 2016 (not giving the date). [S1343] Journal-Every Evening, Wilmington, Del., above, 14 Oct 1959, p. 24, col. 2 (obituary of Mrs. Richard L. Naudain) (not giving the date). [S961] Find A Grave, online, above, memorial for Grace F. Naudain, memorial no. 66374178, viewed on 1 Jul 2016 (giving the year but no other information). [S1343] Journal-Every Evening, Wilmington, Del., above, 14 Oct 1959, p. 24, col. 2 (obituary of Mrs. Richard L. Naudain). Marriage*: He married Jeanett Reed. [S1] Ruth Bennett, Naudain Family of Delaware, above, p. 91 (naming Richard T. Cann as her father). Other Names*: William Eliason, Jr.
[S1] Ruth Bennett, Naudain Family of Delaware (Geneva, Neb. : n.pub., 1941), p. 91 (naming William Conlyn Eliason as his father). This material is a typescript of "notes" in Ms. Bennett's possession and apparently was originally written and compiled by James W. Lattomus. Copies are with the D.A.R. Library, Washington, D.C., and Roger Bartlett, Austin, Tex., and can be viewed at http://www.rabgenealogy.com/ui53.htm. The notes contain some inconsistencies, and page 45 was missing from the D.A.R. Library copy when it was copied. [S961] Find A Grave, online at http://www.findagrave.com, memorial for William Conlyn Eliason, memorial no. 111813708, viewed on 28 Apr 2014 (naming William Conlyn Eliason as his father). [S961] Find A Grave, online, above, memorial for William Conlyn Eliason, memorial no. 111813708, viewed on 28 Apr 2014. [S961] Find A Grave, online at http://www.findagrave.com, memorial for John Naudain Eliason, memorial no. 111813754, viewed on 28 Apr 2014 (naming William Conlyn Eliason as his father). [S961] Find A Grave, online, above, memorial for John Naudain Eliason, memorial no. 111813754, viewed on 28 Apr 2014. 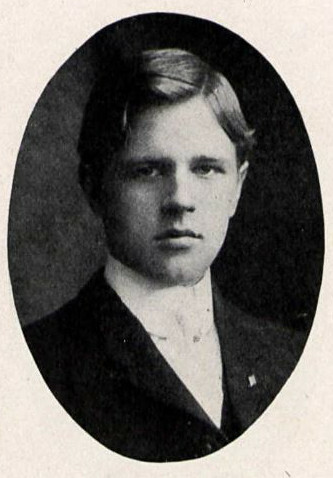 William Conlyn Eliason, Jr. in 1905. "Son Of Tolchester Company Head In Poor Health For Years. "William C. Eliason, Jr., vice-president of the Tolchester Beach Improvement Company of Kent County, and son of Capt. William C. Eliason, president of the company, died yesterday morning at his home, 2728 St. Paul street, following an illness of about three years. He was 31 years old. Besides his father he is survived by his mother, Mrs. Mary Naudain Eliason, and a brother, Henry C. Eliason, with whom he was engaged in the automobile business apart from his duties with the Tolchester Company. "The funeral will be held tomorrow afternoon at 3 o’clock from the home. The Rev. Dr. George C. Peck, pastor of First Methodist Episcopal Church, of which Mr. Eliason was a member, will officiate. Burial will be in Loudon Park Cemetery. [S961] Find A Grave, online at http://www.findagrave.com, memorial for William Conlyn Eliason, Jr., memorial no. 111813070, viewed on 28 Apr 2014 (naming William Conlyn Eliason as his father). [S961] Find A Grave, online, above, memorial for William Conlyn Eliason, Jr., memorial no. 111813070, viewed on 28 Apr 2014. [S961] Find A Grave, online, above, memorial for William Conlyn Eliason, Jr., memorial no. 111813070, viewed on 28 Apr 2014 (giving the date but not the place). [S1365] The Sun, Baltimore, Md., online at http://www.newspapers.com, 31 Dec 1917, p. 5, col. 2 (obituary of Wm. C. Eliason, Jr.). [S961] Find A Grave, online, above, memorial for William Conlyn Eliason, Jr., memorial no. 111813070, viewed on 28 Apr 2014 (not giving the date). [S1365] The Sun, Baltimore, Md., above, 31 Dec 1917, p. 5, col. 2. [S961] Find A Grave, online at http://www.findagrave.com, memorial for Henry Clayton Eliason, memorial no. 111813232, viewed on 28 Apr 2014 (naming William Conlyn Eliason as his father). [S946] Ida Morrison Murphy Shirk, Descendants of Richard and Elizabeth (Ewen) Talbott, above, p. 394 (naming Mary Naudain as his mother). [S312] Social Security Death Index, online at http://tinyurl.com/AncestrySSDI, viewed on 6 Mar 1998 (giving the date but not the place). [S946] Ida Morrison Murphy Shirk, Descendants of Richard and Elizabeth (Ewen) Talbott, above, p. 394. [S961] Find A Grave, online, above, memorial for Henry Clayton Eliason, memorial no. 111813232, viewed on 28 Apr 2014 (giving the date but not the place). [S946] Ida Morrison Murphy Shirk, Descendants of Richard and Elizabeth (Ewen) Talbott, above, p. 394 (spelling her name as Katharine). [S312] Social Security Death Index, online at http://tinyurl.com/AncestrySSDI, viewed on 6 Mar 1998 (not naming the place of death but stating that he lived in Baltimore, Maryland when he died). [S961] Find A Grave, online, above, memorial for Henry Clayton Eliason, memorial no. 111813232, viewed on 28 Apr 2014. Other Names*: Katherine Ridgely, Katherine Mercer Ridgely Eliason, Katherine Mercer Eliason, Katherine Ridgely Eliason, Katherine Eliason. [S946] Ida Morrison Murphy Shirk, Descendants of Richard and Elizabeth (Ewen) Talbott: of Poplar Knowle, West River, Anne Arundel County, Maryland (Baltimore, Md. : Day Print Co., 1927), p. 394 (spelling her name as Katharine). [S312] Social Security Death Index, online at http://tinyurl.com/AncestrySSDI, viewed on 27 Mar 2004 (giving the date but not the place). [S961] Find A Grave, online at http://www.findagrave.com, memorial for Katherine Mercer Ridgely Eliason, memorial no. 111813252, viewed on 28 Apr 2014 (giving the year but no other information). [S312] Social Security Death Index, online at http://tinyurl.com/AncestrySSDI, viewed on 27 Mar 2004 (not naming the place of death but stating that she lived in Lutherville Timonium, Md. when she died). [S961] Find A Grave, online, above, memorial for Katherine Mercer Ridgely Eliason, memorial no. 111813252, viewed on 28 Apr 2014. Note*: He was from Mt. Pleasant, Delaware. [S961] Find A Grave, online at http://www.findagrave.com, memorial for Sarah E. Eliason Houston, memorial no. 60397117, viewed on 20 Jul 2016. [S1343] Journal-Every Evening, Wilmington, Del., online at http://www.newspapers.com, 20 Mar 1920, p. 16, col. 4 (obituary of Mrs. Sarah E. Houston). [S961] Find A Grave, online, above, memorial for William H. Houston, memorial no. 60397064, viewed on 20 Jul 2016. [S1] Ruth Bennett, Naudain Family of Delaware (Geneva, Neb. : n.pub., 1941), p. 92 (naming William Houston as her father). This material is a typescript of "notes" in Ms. Bennett's possession and apparently was originally written and compiled by James W. Lattomus. Copies are with the D.A.R. Library, Washington, D.C., and Roger Bartlett, Austin, Tex., and can be viewed at http://www.rabgenealogy.com/ui53.htm. The notes contain some inconsistencies, and page 45 was missing from the D.A.R. Library copy when it was copied. Scrapbook*: "MRS. SARAH E. HOUSTON. Note*: • She died of pneumonia. [S1343] Journal-Every Evening, Wilmington, Del., online at http://www.newspapers.com, 20 Mar 1920, p. 16, col. 4 (obituary of Mrs. Sarah E. Houston) (naming Andrew Eliason as her father). [S961] Find A Grave, online at http://www.findagrave.com, memorial for Sarah E. Eliason Houston, memorial no. 60397117, viewed on 20 Jul 2016 (naming Andrew Eliason as her father). [S961] Find A Grave, online, above, memorial for Sarah E. Eliason Houston, memorial no. 60397117, viewed on 20 Jul 2016 (naming Lydia E. Cann as her mother). [S961] Find A Grave, online, above, memorial for Sarah E. Eliason Houston, memorial no. 60397117, viewed on 20 Jul 2016. [S1343] Journal-Every Evening, Wilmington, Del., above, 20 Mar 1920, p. 16, col. 4 (obituary of Mrs. Sarah E. Houston). [S1343] Journal-Every Evening, Wilmington, Del., above, 20 Mar 1920, p. 16, col. 4 (not giving the street address) (obituary of Mrs. Sarah E. Houston). [S1365] The Sun, Baltimore, Md., online at http://www.newspapers.com, 19 Mar 1920, p. 8, col. 8 (funeral notice for Mrs. Sarah E. Houston) (including the street address). [S1365] The Sun, Baltimore, Md., above, 19 Mar 1920, p. 8, col. 8 (funeral notice for Mrs. Sarah E. Houston) (stating that burial will be at Middletown, Delaware without naming the cemetery). [S1365] The Sun, Baltimore, Md., above, 19 Mar 1920, p. 8, col. 8. [S1343] Journal-Every Evening, Wilmington, Del., above, 20 Mar 1920, p. 16, col. 4. [S1343] Journal-Every Evening, Wilmington, Del., above, 20 Mar 1920, p. 16, col. 4 (obituary of Mrs. Sarah E. Houston) (first bullet). [S961] Find A Grave, online, above, memorial for Sarah E. Eliason Houston, memorial no. 60397117, viewed on 20 Jul 2016 (second bullet). [S1] Ruth Bennett, Naudain Family of Delaware (Geneva, Neb. : n.pub., 1941), p. 92 (naming Sarah E. Eliason as her mother). This material is a typescript of "notes" in Ms. Bennett's possession and apparently was originally written and compiled by James W. Lattomus. Copies are with the D.A.R. Library, Washington, D.C., and Roger Bartlett, Austin, Tex., and can be viewed at http://www.rabgenealogy.com/ui53.htm. The notes contain some inconsistencies, and page 45 was missing from the D.A.R. Library copy when it was copied. Scrapbook*: "Special to The Evening Journal. Note*: • He was associated with the Tolchester Steamboat Company. [S1] Ruth Bennett, Naudain Family of Delaware (Geneva, Neb. : n.pub., 1941), p. 92 (naming John Mansfield Naudain, Jr. as his father). This material is a typescript of "notes" in Ms. Bennett's possession and apparently was originally written and compiled by James W. Lattomus. Copies are with the D.A.R. Library, Washington, D.C., and Roger Bartlett, Austin, Tex., and can be viewed at http://www.rabgenealogy.com/ui53.htm. The notes contain some inconsistencies, and page 45 was missing from the D.A.R. Library copy when it was copied. [S1365] The Sun, Baltimore, Md., online at http://www.newspapers.com, 24 Mar 1953, p. 22, col. 4 (obituary of W. Houston Naudain) (naming John M. Naudain as his father). [S1] Ruth Bennett, Naudain Family of Delaware, above, p. 92 (giving the date but not the place). [S1343] Journal-Every Evening, Wilmington, Del., online at http://www.newspapers.com, 2 Oct 1920, p. 11, col. 3 (stating that the marriage ceremony was in Church of the Ascension, Baltimore, at 4:30 p.m.). [S1365] The Sun, Baltimore, Md., above, 24 Mar 1953, p. 22, col. 4 (obituary of W. Houston Naudain) (naming Annetta B. Naudain as his surviving spouse). [S1365] The Sun, Baltimore, Md., above, 24 Mar 1953, p. 22, col. 4 (obituary of W. Houston Naudain). [S1337] The Evening Journal, Wilmington, Del., online at http://www.newspapers.com, 4 Oct 1920, p. 8, col. 4. [S1] Ruth Bennett, Naudain Family of Delaware, above, p. 92 (first bullet). [S1365] The Sun, Baltimore, Md., above, 24 Mar 1953, p. 22, col. 4 (advertisement: "Concordia Lodge, No. 13, A.F. & A.M., announces with deep regret the passing of BROTHER W. HOUSTON NAUDAIN. [Signed by] BERNARD W. HOFFMAN, Worshipful Master.") (second bullet). Other Names*: Annetta Backman Naudain, Anetta Naudain. [S312] Social Security Death Index, online at http://tinyurl.com/AncestrySSDI, viewed on 13 Sep 2002. [S1] Ruth Bennett, Naudain Family of Delaware (Geneva, Neb. : n.pub., 1941), p. 92 (giving the date but not the place). This material is a typescript of "notes" in Ms. Bennett's possession and apparently was originally written and compiled by James W. Lattomus. Copies are with the D.A.R. Library, Washington, D.C., and Roger Bartlett, Austin, Tex., and can be viewed at http://www.rabgenealogy.com/ui53.htm. The notes contain some inconsistencies, and page 45 was missing from the D.A.R. Library copy when it was copied. [S1365] The Sun, Baltimore, Md., online at http://www.newspapers.com, 24 Mar 1953, p. 22, col. 4 (obituary of W. Houston Naudain) (naming Annetta B. Naudain as his surviving spouse). [S312] Social Security Death Index, online at http://tinyurl.com/AncestrySSDI, viewed on 13 Sep 2002 (stating that she died in Dec 1980; not naming the place of death but stating that she lived in Baltimore, Md. when she died and that last benefits were sent to an address in Baltimore, Md.). [S1365] The Sun, Baltimore, Md., above, 31 Dec 1980, p. 31, col. 6 (obituary of Annetta Naudain). The Daily News, Lebanon, Pa., 4 Jun 1923, p. 1. Other Names*: Helen Lockwood Naudain Hoffa, Halen Naudain Hoffa, Helen Lockwood Hoffa, Helen Hoffa. [S1] Ruth Bennett, Naudain Family of Delaware (Geneva, Neb. : n.pub., 1941), p. 92 (naming John Mansfield Naudain, Jr. as her father). This material is a typescript of "notes" in Ms. Bennett's possession and apparently was originally written and compiled by James W. Lattomus. Copies are with the D.A.R. Library, Washington, D.C., and Roger Bartlett, Austin, Tex., and can be viewed at http://www.rabgenealogy.com/ui53.htm. The notes contain some inconsistencies, and page 45 was missing from the D.A.R. Library copy when it was copied. [S1337] The Evening Journal, Wilmington, Del., online at http://www.newspapers.com, 5 Jun 1923, p. 6, cols. 2-3 (giving the date but not the place). 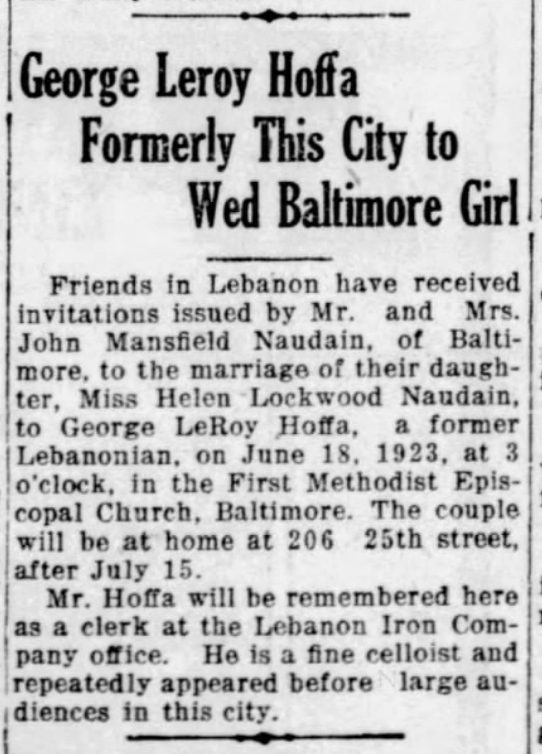 [S1362] Lebanon Semi-Weekly News, Lebanon, Penn., online at http://www.myheritage.com, 4 June 1923, p. 1, col. 3 ("George Leroy Hoffa Formerly This City To Wed Baltimore Girl"). [S1365] The Sun, Baltimore, Md., online at http://www.newspapers.com, 19 Jun 1923, p. 9, col. 1. [S312] Social Security Death Index, online at http://tinyurl.com/AncestrySSDI, viewed on 27 Mar 1998 (stating that she died in Nov 1985; not naming the place of death but stating that she lived in Baltimore, Maryland when she died). [S1365] The Sun, Baltimore, Md., above, 26 Nov 1985, p. 37, col. 5 (obituary of Helen M. Hoffa). [S1097] Descendants of Johann Melchior Hafa, online, viewed 30 Jul 2006 http://people.westminstercollege.edu/faculty/DHoffa/Hoffas/…, (naming William Francis Hoffa as his father). [S1097] Descendants of Johann Melchior Hafa, online, above, (naming Ida May Auten as his mother). [S1097] Descendants of Johann Melchior Hafa, online, above. [S312] Social Security Death Index, online at http://tinyurl.com/AncestrySSDI, viewed 30 Jul 2006 (giving the date but not the place). [S312] Social Security Death Index, online at http://tinyurl.com/AncestrySSDI, viewed 30 Jul 2006 (stating that he died in Feb 1976; not naming the place of death but stating that he lived in Baltimore, Md. when he died). [S1365] The Sun, Baltimore, Md., above, 26 Feb 1976, p. 42, col. 1 (obituary of George Leroy Hoffa) (giving the date but not the place). [S1365] The Sun, Baltimore, Md., above, 26 Feb 1976, p. 42, col. 1 (obituary of George Leroy Hoffa). [S1362] Lebanon Semi-Weekly News, above, 4 June 1923, p. 1, col. 3. [S1] Ruth Bennett, Naudain Family of Delaware (Geneva, Neb. : n.pub., 1941), p. 92 (naming Robert Meeteer Francis as his father). This material is a typescript of "notes" in Ms. Bennett's possession and apparently was originally written and compiled by James W. Lattomus. Copies are with the D.A.R. Library, Washington, D.C., and Roger Bartlett, Austin, Tex., and can be viewed at http://www.rabgenealogy.com/ui53.htm. The notes contain some inconsistencies, and page 45 was missing from the D.A.R. Library copy when it was copied. [S312] Social Security Death Index, online at http://tinyurl.com/AncestrySSDI, viewed on 6 Mar 1998. Note*: He was a farmer near Red Clay Creek Church in White Clay Creek Hundred, Delaware. [S1] Ruth Bennett, Naudain Family of Delaware (Geneva, Neb. : n.pub., 1941), p. 92 (naming McCoy Yearsley as his father). This material is a typescript of "notes" in Ms. Bennett's possession and apparently was originally written and compiled by James W. Lattomus. Copies are with the D.A.R. Library, Washington, D.C., and Roger Bartlett, Austin, Tex., and can be viewed at http://www.rabgenealogy.com/ui53.htm. The notes contain some inconsistencies, and page 45 was missing from the D.A.R. Library copy when it was copied. [S1] Ruth Bennett, Naudain Family of Delaware (Geneva, Neb. : n.pub., 1941), p. 92. This material is a typescript of "notes" in Ms. Bennett's possession and apparently was originally written and compiled by James W. Lattomus. Copies are with the D.A.R. Library, Washington, D.C., and Roger Bartlett, Austin, Tex., and can be viewed at http://www.rabgenealogy.com/ui53.htm. The notes contain some inconsistencies, and page 45 was missing from the D.A.R. Library copy when it was copied. [S1] Ruth Bennett, Naudain Family of Delaware (Geneva, Neb. : n.pub., 1941), p. 92 (naming McCoy Yearsley as her father). This material is a typescript of "notes" in Ms. Bennett's possession and apparently was originally written and compiled by James W. Lattomus. Copies are with the D.A.R. Library, Washington, D.C., and Roger Bartlett, Austin, Tex., and can be viewed at http://www.rabgenealogy.com/ui53.htm. The notes contain some inconsistencies, and page 45 was missing from the D.A.R. Library copy when it was copied. [S1] Ruth Bennett, Naudain Family of Delaware (Geneva, Neb. : n.pub., 1941), pp. 92-93 (naming Jonas S. Klair as her father). This material is a typescript of "notes" in Ms. Bennett's possession and apparently was originally written and compiled by James W. Lattomus. Copies are with the D.A.R. Library, Washington, D.C., and Roger Bartlett, Austin, Tex., and can be viewed at http://www.rabgenealogy.com/ui53.htm. The notes contain some inconsistencies, and page 45 was missing from the D.A.R. Library copy when it was copied. [S1] Ruth Bennett, Naudain Family of Delaware (Geneva, Neb. : n.pub., 1941), pp. 92-93 (naming Jonas S. Klair as his father). This material is a typescript of "notes" in Ms. Bennett's possession and apparently was originally written and compiled by James W. Lattomus. Copies are with the D.A.R. Library, Washington, D.C., and Roger Bartlett, Austin, Tex., and can be viewed at http://www.rabgenealogy.com/ui53.htm. The notes contain some inconsistencies, and page 45 was missing from the D.A.R. Library copy when it was copied. [S1] Ruth Bennett, Naudain Family of Delaware, above, p. 93 (giving 7 Mar 1872 as his birth date and listing him as the third child). [S1] Ruth Bennett, Naudain Family of Delaware (Geneva, Neb. : n.pub., 1941), p. 93. This material is a typescript of "notes" in Ms. Bennett's possession and apparently was originally written and compiled by James W. Lattomus. Copies are with the D.A.R. Library, Washington, D.C., and Roger Bartlett, Austin, Tex., and can be viewed at http://www.rabgenealogy.com/ui53.htm. The notes contain some inconsistencies, and page 45 was missing from the D.A.R. Library copy when it was copied. [S1] Ruth Bennett, Naudain Family of Delaware, above, p. 93 (giving 22 Oct 1887 as his birth date, which is believed to be incorrect and which possibly is a misprint of 22 Oct 1882). [S1] Ruth Bennett, Naudain Family of Delaware, above, p. 93 (giving 22 Oct 1887 as his birth date). "Arnold Naudain, 44 years old, owner and manager of Naudain’s sawmill near Mendenhall Mills, Hockessin; Vincent Smith, 23 years old, and Raymond Flamer, colored, 24 years old, both employed at the sawmill, were badly injured yesterday when the mill suddenly blew up, as the boiler at the place exploded, scattering debris for some distance around the place. "Naudain and Flamer were taken to the Delaware Hospital where Naudain was found to have a fracture of the right arm and to be injured in the side. Flamer had a lacerated arm and was cut on the side. Smith was badly scalded about the legs and arms when the boiler exploded but was not sent to the hospital. He was treated by Robert Tomlinson, of Wilmington, who was summoned. Note*: • He was a contractor and builder, and they lived near Hockessin, Delaware, on the place next to the home of Mary's father, who also was a contractor and builder. [S961] Find A Grave, online at http://www.findagrave.com, memorial for viewed on 3 Apr 2010 (Arnold Naudain, memorial no. 9096370) (naming Arnold Naudain, Jr. as his father). [S1] Ruth Bennett, Naudain Family of Delaware, above, pp. 93, 100. [S961] Find A Grave, online, above, memorial for Arnold Naudain, memorial no. 9096370, viewed on 3 Apr 2010. [S1] Ruth Bennett, Naudain Family of Delaware, above, pp. 93 (not giving the date or place), 100 (giving the date but no other information). [S961] Find A Grave, online, above, memorial for Arnold Naudain, memorial no. 9096370, viewed on 3 Apr 2010 (not giving the date or place). [S961] Find A Grave, online, above, memorial for Mary Armstrong Jordan Naudain, memorial no. 9096432, viewed on 3 Apr 2010 (not giving the date or place). [S1343] Journal-Every Evening, Wilmington, Del., online at http://www.newspapers.com, 13 Apr 1906, p. 3, col. 2. [S1448] Journal-Every Evening, Wilmington, Del., online at http://www.newspapers.com, 20 Jun 1956, p. 10, col. 7 (obituary for Mrs. Mary A. Naudain) (notigiving the date or place; describing her as "wife of Arnold Naudain"). [S1448] Journal-Every Evening, Wilmington, Del., above, 7 Jan 1958, p. 18, col. 5 (obituary for Arnold Naudain) (not giving the date or place; describing her as his wife). [S1448] Journal-Every Evening, Wilmington, Del., above, 7 Jan 1958, p. 18, col. 5 (obituary for Arnold Naudain) (stating that he died "last night"). [S1448] Journal-Every Evening, Wilmington, Del., above, 7 Jan 1958, p. 18, col. 5 (obituary for Arnold Naudain) (identifying the cemetery as Red Clay Creek Cemetery). [S1340] The Morning News, Wilmington, Del., online at http://www.newspapers.com, 21 May 1921, p. 1, col. 5. [S1] Ruth Bennett, Naudain Family of Delaware, above, p. 100 (first bullet). [S1448] Journal-Every Evening, Wilmington, Del., above, 7 Jan 1958, p. 18, col. 5 (obituary for Arnold Naudain) (second bullet). [S1] Ruth Bennett, Naudain Family of Delaware, above, p. 100 (naming Arnold Naudain as his father). [S961] Find A Grave, online, above, memorial for Arnold Naudain, memorial no. 9096370, viewed on 3 Apr 2010 (naming Arnold Naudain as his father). [S1] Ruth Bennett, Naudain Family of Delaware, above, p. 100 (naming Arnold Naudain as her father). [S961] Find A Grave, online, above, memorial for Elizabeth Armstrong Naudain Nichols, memorial no. 9096459, viewed on 7 Aug 2018 (naming Arnold Naudain as her father). Other Names*: Mary Armstrong Jordan Naudain, Mary Jordan Naudain, Mary Armstrong Naudain, Mary Naudain. "Marriage of Miss Mary Armstrong Jordan and Arnold Naudain. "Miss Mary Armstrong Jordan and Arnold Naudain were married at the home of the bride’s parents, Mr. and Mrs. Howard Jordan, at Hockessin, last evening. The ceremony was performed by Rev. J. D. Blake. The bride was attired in a gown of white organdie, and she carried Bride roses. The ceremony was performed under an arch of greens and white carnations, in the parlor. Following the ceremony there was a reception, when the newly-married couple received congratulations. Mr. and Mrs. Naudain received many wedding presents. Mr. Naudain is a contractor and builder. Their future home will be near Hockessin. Note*: • She lived on Mill Creek Road in Mill Creek Hundred, New Castle County, Delaware all her life. • She was a member of Red Clay Creek Presbyterian Church. • A history of the area around the Mendenhall house and mill is here. [S1] Ruth Bennett, Naudain Family of Delaware (Geneva, Neb. : n.pub., 1941), p. 100. This material is a typescript of "notes" in Ms. Bennett's possession and apparently was originally written and compiled by James W. Lattomus. Copies are with the D.A.R. Library, Washington, D.C., and Roger Bartlett, Austin, Tex., and can be viewed at http://www.rabgenealogy.com/ui53.htm. The notes contain some inconsistencies, and page 45 was missing from the D.A.R. Library copy when it was copied. [S1343] Journal-Every Evening, Wilmington, Del., online at http://www.newspapers.com, 13 Apr 1906, p. 3, col. 2 (naming Howard Jordan as her father). [S1448] Journal-Every Evening, Wilmington, Del., online at http://www.newspapers.com, 20 Jun 1956, p. 10, col. 7 (obituary for Mrs. Mary A. Naudain) (naming Howard H. Jordan as her father). [S1448] Journal-Every Evening, Wilmington, Del., above, 20 Jun 1956, p. 10, col. 7 (obituary for Mrs. Mary A. Naudain) (naming Joanne Alice Lynam Jordan as her mother). [S961] Find A Grave, online at http://www.findagrave.com, memorial for Mary Armstrong Jordan Naudain, memorial no. 9096432, viewed on 3 Apr 2010. [S1343] Journal-Every Evening, Wilmington, Del., above, 13 Apr 1906, p. 3, col. 2. [S1448] Journal-Every Evening, Wilmington, Del., above, 20 Jun 1956, p. 10, col. 7 (obituary for Mrs. Mary A. Naudain) (notigiving the date or place; describing her as "wife of Arnold Naudain"). [S961] Find A Grave, online, above, memorial for Mary Armstrong Jordan Naudain, memorial no. 9096432, viewed on 3 Apr 2010 (giving the year but no other information). [S1448] Journal-Every Evening, Wilmington, Del., above, 20 Jun 1956, p. 10, col. 7 (obituary for Mrs. Mary A. Naudain). [S1441] Wilmington Morning News, Wilmington, Del., online at http://www.newspapers.com, 21 Jun 1956, p. 4, col. 8 (death notice for Mary Armstrong Naudain) (identifying the cemetery as Red Clay Creek Cemetery). [S1448] Journal-Every Evening, Wilmington, Del., above, 20 Jun 1956, p. 10, col. 7 (obituary for Mrs. Mary A. Naudain) (first bullet). [S1448] Journal-Every Evening, Wilmington, Del., above, 20 Jun 1956, p. 10, col. 7 (obituary for Mrs. Mary A. Naudain) (second bullet). [S1448] Journal-Every Evening, Wilmington, Del., above, 20 Jun 1956, p. 10, col. 7 (obituary for Mrs. Mary A. Naudain) (fourth bullet). [S1] Ruth Bennett, Naudain Family of Delaware, above, p. 100 (naming Mary Jordan as his mother). [S961] Find A Grave, online, above, memorial for Mary Armstrong Jordan Naudain, memorial no. 9096432, viewed on 3 Apr 2010 (naming Mary Armstrong Jordan Naudain as his mother). [S1] Ruth Bennett, Naudain Family of Delaware, above, p. 100 (naming Mary Jordan as her mother). [S961] Find A Grave, online, above, memorial for Elizabeth Armstrong Naudain Nichols, memorial no. 9096459, viewed on 7 Aug 2018 (naming Mary Armstrong Jordan Naudain as her mother). William Peoples Naudain's tombstone, Red Clay Creek Presbyterian Church Cemetery, Wilmington, Del., courtesy of Richard Wright. Note*: • He graduated from Delaware College, Newark, Delaware, on 19 Jun 1901 with a bachelor of agriculture degree. [S961] Find A Grave, online at http://www.findagrave.com, memorial for viewed on 3 Apr 2010 (William Peoples Naudain, memorial no. 9096445) (naming Arnold Naudain, Jr. as his father). [S961] Find A Grave, online, above, memorial for William Peoples Naudain, memorial no. 9096445, viewed on 3 Apr 2010 (giving the year but not the day). [S1343] Journal-Every Evening, Wilmington, Del., online at http://www.newspapers.com, 1 Jan 1945, p. 5, col. 3 (obituary for William P. Naudain) (not giving the date but stating that he was sixty-three years old when he died on 31 Dec 1944). [S1] Ruth Bennett, Naudain Family of Delaware, above, p. 100. [S961] Find A Grave, online, above, memorial for viewed on 3 Apr 2010 (William H. Naudain, memorial no. 9096448). [S961] Find A Grave, online, above, memorial for viewed on 3 Apr 2010 (Helena V. Woodward Naudain, memorial no. 9096422). [S961] Find A Grave, online, above, memorial for William Peoples Naudain, memorial no. 9096445, viewed on 3 Apr 2010 (giving the year but no other information). [S1343] Journal-Every Evening, Wilmington, Del., above, 1 Jan 1945, p. 5, col. 3 (obituary for William P. Naudain) (stating that he died after a long illness). [S961] Find A Grave, online, above, memorial for William Peoples Naudain, memorial no. 9096445, viewed on 3 Apr 2010 (not giving the date). [S1343] Journal-Every Evening, Wilmington, Del., above, 1 Jan 1945, p. 5, col. 3 (obituary for William P. Naudain). [S1] Ruth Bennett, Naudain Family of Delaware, above, p. 100 (second bullet). [S1365] The Sun, Baltimore, Md., online at http://www.newspapers.com, 20 Jun 1901, p. 9, col. 1 (first bullet). [S1] Ruth Bennett, Naudain Family of Delaware, above, p. 100 (naming William Peoples Naudain as his father). [S961] Find A Grave, online, above, memorial for viewed on 3 Apr 2010 (William H. Naudain, memorial no. 9096448) (naming William Peoples Naudain as his father). [S961] Find A Grave, online, above, memorial for viewed on 3 Apr 2010 (Edward A. Naudain, memorial no. 9096373) (naming William Peoples Naudain as his father). [S961] Find A Grave, online, above, memorial for viewed on 3 Apr 2010 (Warner Woodward Naudain, memorial no. 47025831) (naming William Peoples Naudain as his father). [S1] Ruth Bennett, Naudain Family of Delaware, above, p. 100 (naming Edward Woodward as her father). [S961] Find A Grave, online at http://www.findagrave.com, memorial for viewed on 3 Apr 2010 (Helena V. Woodward Naudain, memorial no. 9096422). [S1] Ruth Bennett, Naudain Family of Delaware, above, p. 100 (naming Helen V. Woodward as his mother). [S961] Find A Grave, online, above, memorial for viewed on 3 Apr 2010 (William H. Naudain, memorial no. 9096448) (naming Helena V. Woodward Naudain as his mother). [S961] Find A Grave, online, above, memorial for viewed on 3 Apr 2010 (Edward A. Naudain, memorial no. 9096373) (naming Helena V. Woodward Naudain as his mother). [S961] Find A Grave, online, above, memorial for viewed on 3 Apr 2010 (Warner Woodward Naudain, memorial no. 47025831) (naming Helena V. Woodward Naudain as his mother). Marriage*: He married Rebecca _____. [S1] Ruth Bennett, Naudain Family of Delaware (Geneva, Neb. : n.pub., 1941), p. 93 (naming James L. Foard as her father). This material is a typescript of "notes" in Ms. Bennett's possession and apparently was originally written and compiled by James W. Lattomus. Copies are with the D.A.R. Library, Washington, D.C., and Roger Bartlett, Austin, Tex., and can be viewed at http://www.rabgenealogy.com/ui53.htm. The notes contain some inconsistencies, and page 45 was missing from the D.A.R. Library copy when it was copied. Marriage*: She married James L. Foard. [S1] Ruth Bennett, Naudain Family of Delaware (Geneva, Neb. : n.pub., 1941), p. 93 (naming Rebecca Foard as her mother). This material is a typescript of "notes" in Ms. Bennett's possession and apparently was originally written and compiled by James W. Lattomus. Copies are with the D.A.R. Library, Washington, D.C., and Roger Bartlett, Austin, Tex., and can be viewed at http://www.rabgenealogy.com/ui53.htm. The notes contain some inconsistencies, and page 45 was missing from the D.A.R. Library copy when it was copied. 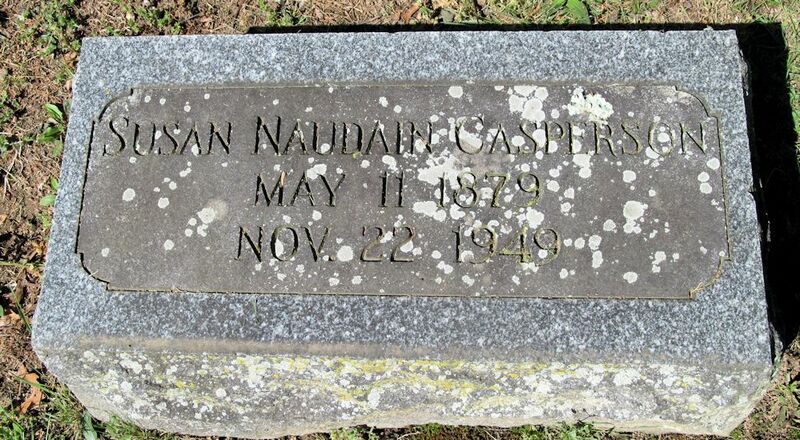 Susan Naudain Casperson's tombstone, Old Saint Anne's Church Cemetery, Middletown, Del., courtesy of Denise Neale. Other Names*: Susan Naudain, Susan May Naudain Casperson, Susan Naudain Casperson, Susan May Casperson, Susan Casperson. Note*: • She spent her early life in Elkton, Maryland. At her death, she had lived in Miami, Florida for twenty-six years. She was survived by a daughter and a brother. [S1] Ruth Bennett, Naudain Family of Delaware (Geneva, Neb. : n.pub., 1941), pp. 93 (naming James Mountain Naudain as her father), 100 (naming James M. Naudain as her father). This material is a typescript of "notes" in Ms. Bennett's possession and apparently was originally written and compiled by James W. Lattomus. Copies are with the D.A.R. Library, Washington, D.C., and Roger Bartlett, Austin, Tex., and can be viewed at http://www.rabgenealogy.com/ui53.htm. The notes contain some inconsistencies, and page 45 was missing from the D.A.R. Library copy when it was copied. [S1074] 1880 U.S. Census, Cecil County, Md., schedule 1, 3rd election dist., p. 11, dwelling 72, family 72 (indicating that she was born in Maryland in 1878 or 1879). [S1] Ruth Bennett, Naudain Family of Delaware, above, pp. 93, 100 (giving the date but not the place). [S1441] Wilmington Morning News, Wilmington, Del., online at http://www.newspapers.com, 3 Dec 1949, p. 4, col. 3 (obituary for Mrs. Susan N. Casperson). [S961] Find A Grave, online at http://www.findagrave.com, memorial for Susan Naudain Casperson, memorial no. 66373631, viewed on 18 Jul 2018 (giving the date but not the place). [S1441] Wilmington Morning News, Wilmington, Del., above, 3 Dec 1949, p. 4, col. 3 (obituary for Mrs. Susan N. Casperson) (not giving the date or place but stating that at her death she was the widow of Dr. Roibert H. Casperson). [S1466] Courier-Post, Camden, N.J., online at http://www.newspapers.com, 1 Jul 1909, p. 7, col. 4. [S1441] Wilmington Morning News, Wilmington, Del., above, 3 Dec 1949, p. 4, col. 3 (obituary for Mrs. Susan Naudain Casperson). [S1441] Wilmington Morning News, Wilmington, Del., above, 3 Dec 1949, p. 4, col. 3 (obituary for Mrs. Susan Naudain Casperson) (first bullet). [S961] Find A Grave, online, above, memorial for Susan Naudain Casperson, memorial no. 66373631, viewed on 18 Jul 2018 (stating she died on 22 Nov 1949) (second bullet). [S1441] Wilmington Morning News, Wilmington, Del., above, 3 Dec 1949, p. 4, col. 3 (obituary for Mrs. Susan Naudain Casperson) (stating she died on 29 Nov 1949) (second bullet). [S1] Ruth Bennett, Naudain Family of Delaware, above, p. 100 (naming Susan May Naudain as her mother). [S1460] Naples Daily News, Naples, Fla., online at http://www.newspapers.com, 19 Apr 1977, p. 27, col. 8 (obituary for Nadaene Casperson Kane) (naming Susan Casperson as her mother). 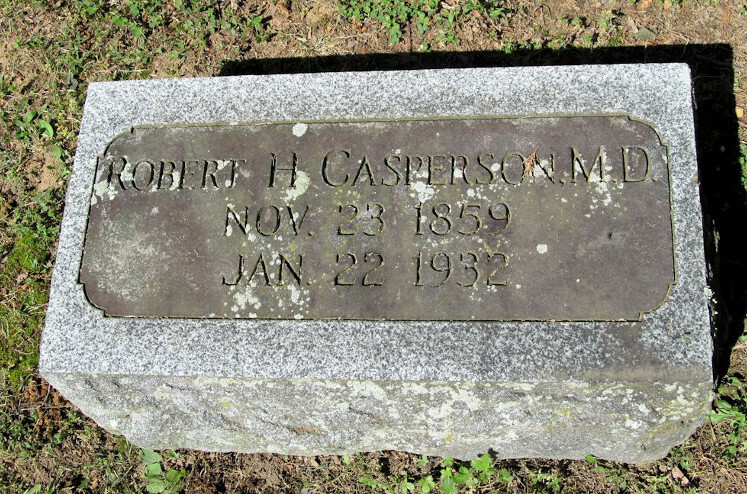 Dr. Robert H. Casperson's tombstone, Old Saint Anne's Church Cemetery, Middletown, Del., courtesy of Denise Neale. [S961] Find A Grave, online at http://www.findagrave.com, memorial for Dr. Robert H. Casperson, memorial no. 66373630, viewed on 18 Jul 2018. [S1459] Miami Daily News, Miami, Fla., online at http://www.newspapers.com, 23 Jan 1932, p. 9, col. 3 (obituary for Dr. Robert H. Casperson) (not giving the date but stating that he was seventy-two years old when he died on 22 Jan 1932). [S1] Ruth Bennett, Naudain Family of Delaware (Geneva, Neb. : n.pub., 1941), pp. 93, 100 (giving the date but not the place). This material is a typescript of "notes" in Ms. Bennett's possession and apparently was originally written and compiled by James W. Lattomus. Copies are with the D.A.R. Library, Washington, D.C., and Roger Bartlett, Austin, Tex., and can be viewed at http://www.rabgenealogy.com/ui53.htm. The notes contain some inconsistencies, and page 45 was missing from the D.A.R. Library copy when it was copied. [S1441] Wilmington Morning News, Wilmington, Del., online at http://www.newspapers.com, 3 Dec 1949, p. 4, col. 3 (obituary for Mrs. Susan N. Casperson) (not giving the date or place but stating that at her death she was the widow of Dr. Roibert H. Casperson). [S961] Find A Grave, online, above, memorial for Dr. Robert H. Casperson, memorial no. 66373630, viewed on 18 Jul 2018 (giving the date but not the place; stating that he died in "last night"). [S1459] Miami Daily News, Miami, Fla., above, 23 Jan 1932, p. 9, col. 3 (obituary for Dr. Robert H. Casperson). [S1] Ruth Bennett, Naudain Family of Delaware, above, p. 100 (naming Robert H. Casperson, M.D. as her father). [S1460] Naples Daily News, Naples, Fla., online at http://www.newspapers.com, 19 Apr 1977, p. 27, col. 8 (obituary for Nadaene Casperson Kane) (naming Dr. Robert H. Casperson as her father). Note*: • They lived in Camden, New Jersey and were members of St. Paul's P.E. Church. He was a conductor for the Baltimore & Ohio Railroad. [S1] Ruth Bennett, Naudain Family of Delaware (Geneva, Neb. : n.pub., 1941), pp. 93 (naming James Mountain Naudain as his father), 100 (naming James M. Naudain as his father). This material is a typescript of "notes" in Ms. Bennett's possession and apparently was originally written and compiled by James W. Lattomus. Copies are with the D.A.R. Library, Washington, D.C., and Roger Bartlett, Austin, Tex., and can be viewed at http://www.rabgenealogy.com/ui53.htm. The notes contain some inconsistencies, and page 45 was missing from the D.A.R. Library copy when it was copied. [S1] Ruth Bennett, Naudain Family of Delaware, above, pp. 93 (giving the date but not the place), 100 (giving the date but not the place), 101 (giving the place but not the date). [S1508] Cecil Whig, Elkton, Md., online at https://www.newspaperarchive.com, 9 Dec 1905, p. 1, col. 5 (marriage announcement for Miss M. Winifred Welch and Mr. J. Foard Naudain) (stating that Rev. D. H. Underhill performed the ceremony). [S1] Ruth Bennett, Naudain Family of Delaware, above, pp. 93, 101 (first bullet). [S1458] Chester Times, Chester, Penn., online at http://www.newspapers.com, 8 Nov 1949, p. 4, col. 8 (second bullet). [S1508] Cecil Whig, Elkton, Md., online, above, 9 Dec 1905, p. 1, col. 5. [S1] Ruth Bennett, Naudain Family of Delaware, above, pp. 100-101 (naming James Foard Naudain as his father). Other Names*: Mabel Welch, Mabel Winifred Welch Naudain, Mabel Welch Naudain, Mabel Winifred Naudain, Mabel Naudain. [S1] Ruth Bennett, Naudain Family of Delaware, above, p. 101. [S1] Ruth Bennett, Naudain Family of Delaware, above, pp. 100-101 (naming Mabel Winifred Welch as his mother).